It’s that great day when we head out to meet an amphibian! Grab your gear and get ready because we’re going to meet a little frog in South Africa. 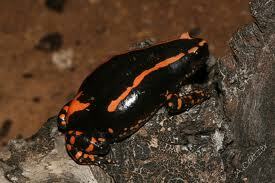 MEET THE BANDED RUBBER FROG! 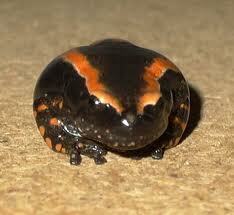 Banded Rubber Frogs have short legs. They are black with pink or red stripes. Banded rubber frogs inflate their bodies when threatened. 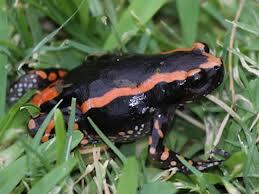 Banded rubber frogs walk instead of hopping or jumping. 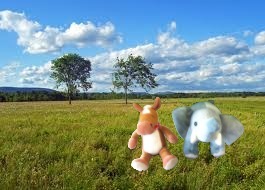 They produce toxins that can be harmful to humans if threatened. Banded rubber frogs are cute little frogs. Their bright colors help warn predators that they are toxic. Thanks we need that warning! I also eat ants, when I get lucky. If Mom sees that guy all puffed up like that, she might put him on treat restriction. That’s what happened to me when I weighed 23 pounds instead of 21.